Peter used his own software (not shown here) to divide a map of the UK into over 1600 .png image files. The files take a while to load but thereafter the program is slick and responsive. The robust code is helpfully commented and should prove to be useful for reference. As you pilot the plane over a map of the UK and part of France you are continuously shooting and need to direct your bullets at aliens. A small scale map shows your position and the positions of all of the aliens. Control the plane with the arrow keys. You are the pilot and the up, down, left and right keys cause the plane to accelerate, decelerate, turn left and turn right, respectively. Press p to pause. The first screenshot shows the plane near the beginning of the game. The map on the right indicates the positions of the plane and aliens in yellow and red, respectively. 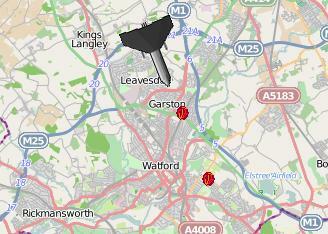 We could not resist flying the plane over Watford. See the approach in the screenshot below. Download here a zip file containing the main code (SaveUK.txt), 13 bitmap image files, and a folder named images containing over 1600 png images (tiles) comprising the main map. You should unzip the files so that the images folder and the bitmaps are in the program folder. In order to run the program you will need to use SDL files and additional libraries. (See Getting Started with SDL for download details of SDL.dll, SDL.pas) and other Pascal header files for SDL libraries. The program requires the libraries SDL.dll, SDL_gfx.dll SDL_image.dll, sdl_ttf.dll, libfreetype-6.dll and zlib1.dll. You can put these files in the program folder or with thousands of other libraries in your system folder if they are not already in your system. See the introduction to SpaceShooter for individual download details and/or download several at once in a zip file of libraries that are required by the Elysian Pascal game development framework. //+25 is to centre alien hitTesting around centre of alien not top left corner of alien. //+61 is to centre alien hitTesting around centre of alien not top left corner of alien. Could you use this program to help you to code your own map game?